Earn money from your site without investing and have the option of investing more if you want. If you don’t want to invest your own money or take the risk of developing your waterpower site by yourself, GreenBug Energy will lease your site and pay you an annual lease payment of 8% percent of the operating income earned from the site. It really doesn’t matter to us whether you develop the site yourself or jointly develop it with us by leasing the site. It affects ownership structure/ financing, but affects nothing in terms of operationally how we would develop the site or the steps involved. 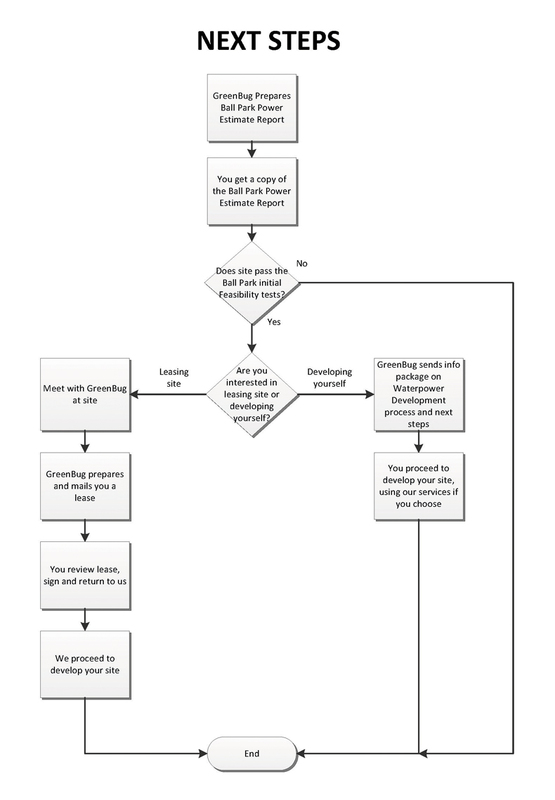 This section attempts to explain as clearly as possible how the site leasing process works. You should review the lease thoroughly and have your lawyer review the lease, and do not rely upon this section’s interpretation of the lease. In order to first assess whether you have an opportunity or not worth pursuing, you should request a FREE “Ballpark Power Estimate” report be prepared for your site by GreenBug. After GreenBug provides this report to you and if the Ball Park report indicates that you have an opportunity, then you have a decision to make. At the end of the Ballpark report it says that the next step would be a Site Feasibility Assessment, which is the second phase of our site feasibility assessment process. At the end of the Ballpark report it indicates that you can hire us to do this if you want to develop the site by yourself. We can provide a quote for this. You can also choose to develop the site with GreenBug by signing a lease. The lease gives you (the lessor) 8% of the operating income with no investment for the use of the site. Once all approvals are in place and we’re ready to build the lease also gives you the right to purchase additional equity up to 49%. If you opt for signing a lease, we do not proceed with the Site Feasibility Assessment until a lease is signed. Once you sign a lease, everything moving forward happens at our cost, we would come do the Site feasibility assessment, we prepare the SFA report, and you can see the report when completed, but you don’t have to decide whether you want to invest further until later, when we have to finalize who’s financing the project. At that time, the lease gives you a right to decide on if you want to purchase more equity or not and you would be able to see the financial projections to help you decide. If the site passes the SFA, we move on and submit a FIT application, if we get a FIT contract, we do a Class Environmental assessment, and final project plan, get all approvals and when we’re ready to proceed you get a copy of the final project plan with financial projections, and we finalize investment at that time. The way the lease works, is that if the site doesn’t pass our SFA, or if we don’t get FIT contract or if we don’t get environmental approvals, etc, the lease becomes null and void. Therefore, if something ends up derailing the project in the planning phases, the lease becomes null and void. Therefore, if you choose to lease your site, you would receive 8% of the operating income as the lease revenue. The lease is between you and GreenBug Energy Inc. The lease provides an option of purchasing additional equity. If you decide you want to purchase additional equity, we have to setup a limited partnership to effect this because you can’t invest in GreenBug. In this case, the lease gets transferred to a new Limited Partnership, so now the lease is between you and the Limited Partnership. You can purchase up to 49% of the total equity of the Limited Partnership and thereby own 49% of the project if you want to. The final decision on whether to invest additional equity would not have to be made until the final project plan is completed and you can see total project cost and expected revenues as mentioned above. The purchase price would be based on total project cost multiplied by the additional equity percent you wish to purchase. While your potential interest in acquiring further equity can drive the decision to form the limited partnership so can other concerns. For instance, in order to get a FIT contract in this environment (in Ontario), public participation points are encouraged. Therefore we could be attempting to get local municipal involvement which would also require the Limited Partnership structure. Also, assuming you did not want to purchase additional equity, an additional outside investor could also invest if GreenBug didn’t want all the equity some reason. So the LP also provides some financing flexibility. If you are interested in moving forward with a lease, we have to get the lawyers to do a title search etc to verify ownership of your property and we have them populate a blank lease with your specific name and site information, and because that costs us some money to do and because we have to submit a site sketch as well, we would come and visit the site first because we like to see every site before even populating a lease. We would complete the sketch, and the field work portion of the SFA and we would bring a blank lease at that time for your review. We would leave the blank lease with you, give you a chance to review it and after you review it, if you say you want to proceed with the lease, we would give your information to our lawyers along with the site sketch, they would populate a lease with your information and when done that lease would be sent for your signature. Once we have the signed lease back, we go ahead and proceed, first with the office work portion of the site feasibility assessment and then latter steps hopefully. That’s how things would proceed. In terms of timing, things take some time, much of it waiting for government, such as FIT application decisions. The whole process can take place in about 18 months minimum to the point where you’re generating power. But it can take several years. If you do want to proceed, we need to complete SFA’s before the season gets too late, we can’t do them in winters, and the summer and fall seasons are best to evaluate low flows. For you, the site owner, leasing your site gives you income with no personal investment and no risk. It also allows you to have the option of investing further if you choose. Request a free Ball Park Power Estimate. After you submit your request for a Ball Park Power Estimate for your site these are the next steps that will occur.